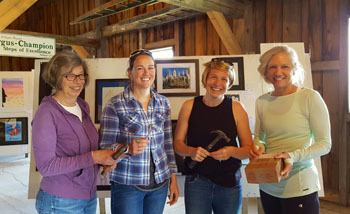 On May 15 over 220 people filled the Phillips Barn enjoying the 140 art entries submitted by students from nine area schools. Thanks go to volunteers, parents, area school teachers, and event sponsors for making this biennial event a big success. Judges for the competition were: Garrett Evans, Jay Koron, and Allison Vernon. Thanks also go to our hard-working committee above: Linda Jaggard, Rosanna Long, Casey Biuso and Debbie Zeller. Supporting sponsors: Clarke's Hardware, Morgan Hill Bookstore, Bob and Debbie Zeller, David and Janet Royle, Bob Odell, Linda Jaggard, and John Gutman. Brooke Solomon, her mom Lynn, and videographer Greg Uhrin each played a special part in producing the introductory video for the new self-guided Village tour this summer. Conceived and created by board member Tom Little, the tablet tour will be ready for use when the Historical Village opens Memorial Day weekend. We appreciate the support of these businesses and hope you will thank them too. Businesses may log on to the NLHS website to join. Your membership will run through December 31, 2016. The Historical Village and Museum will open on Sunday, May 29, and welcome visitors every Sunday from 1-4 p.m. through Columbus Day. Young visitors are invited to participate in a Village-wide Scavenger Hunt and try their hands at stilts or hoop rolling. This year the Village is offering self-guided tours with a tablet provided by NLHS, or you may use your own phone. Don't forget to stop at the Country Store, which is newly stocked with neat gifts and penny candy. Join us for a tasty and fun-filled afternoon Sunday, June 26, in the New London Historical Village from 1-4 p.m. Enter the Berry Delicious Contest & vie for cash prizes. Help crank out delicious strawberry ice cream on the old-fashioned ice cream maker. The Historical Society looks forward to welcoming Blue Star families to the Village this summer. Blue Star Museums is in its 7th year of collaboration among: National Endowment for the Arts, Blue Star Families, the Department of Defense, and more than 2,000 museums across America. Free admission is offered to the nation’s active-duty military personnel and their families, including National Guard and Reserve, from Memorial Day through Labor Day. Watch for your 2016 membership renewal letter in the mail this coming week. There are several new benefits. Fill out the form at the bottom of your letter or log on to the NLHS website to join. 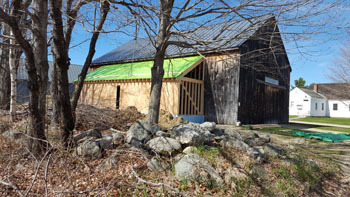 Construction has begun on an up-to-date restroom facility attached to the Phlllips Barn and should be completed by early June. History + people skills = Village Volunteer. NLHS Village guides, greeters, and docents have been gearing up for the 2016 season, (see photo below) and they are always happy to welcome new folks to the roster. We have a spot to match your passion. From behind the scenes to customer service, there are ample opportunities and schedule flexibility. 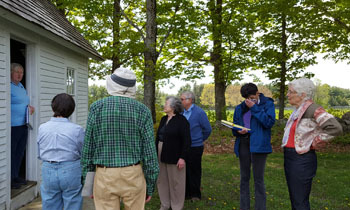 Debbie Hall, (left) co-chair of the Village volunteers conducting an orientation tour for the newest Village guides. Do you have children or grandchildren who are curious about how people lived in the 19th century? Are they entering either the 5th or 6th grade in the fall? Be sure to enroll them in our new Hands-on History camp to experience life as it was lived over 100 years ago here in New London. Two one-week sessions are available: July 11 – 16 and July 18 – 22. The camp runs from 9 a.m. to 3 p.m. each day, and you may attend one or both of the sessions. Cost is $200 for one week. $375 for two weeks. 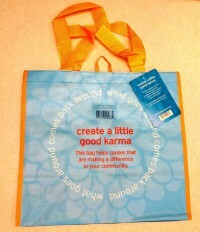 During the month of June, purchase your reusable Hannaford’s Karma Shopping Bag, and Hannaford’s will donate a dollar to the New London Historical Society. We are honored to be chosen. Rentals: For more information log on to our website under the “Programs & Rentals” tab.